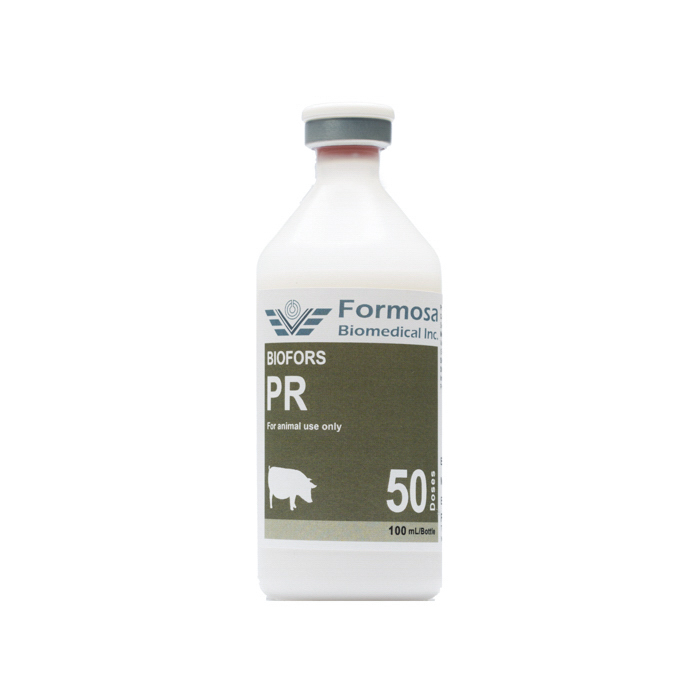 BIOFORS PR contains inactivated Swine Pseudorabies Virus (PRV). This vaccine is produced by inoculating PRV was in cell cultures Amplified PRV were then inactivated and oil adjuvant was subsequently. This vaccine has physical characteristics as opaque, viscous white oil emulsion. Prevention of Swine Pseudorabies in pigs. Sow: Administer 1 dose to each sow at time between pregnancies via intramuscular injection. Piglet: 1st vaccination: Administer 1 dose to each piglet at 3-5 weeks of age via subcutaneous or intramuscular injection. 2nd vaccination: Administer 1 dose to each piglet via a subcutaneous or intramuscular injection at least 2 weeks after 1st vaccination. Store in a dark place at 2-8ºC. Do not freeze. ·Follow the instructions from and use under supervision by a veterinarian, and this vaccine is for veterinary use only. ·Observe the healthy status of each swine before vaccination. Do not vaccinate swine showing signs of fever, diarrhea or other unusual symptoms. ·Do not use this vaccine in swine in combination with other vaccines or drug treatments. ·Recover to room temperature and shake well to mix thoroughly before use. Protect from direct sunlight. ·Use sterilized vaccination equipment for vaccination. Sterilize vaccination equipment with heat or autoclave sterilization. Do not sterilize with alcohol instead. Sterilize vaccination site with 70% alcohol. ·Do not save unused vaccine for later administration. Autoclave unused vaccines and vaccine containers before disposal.